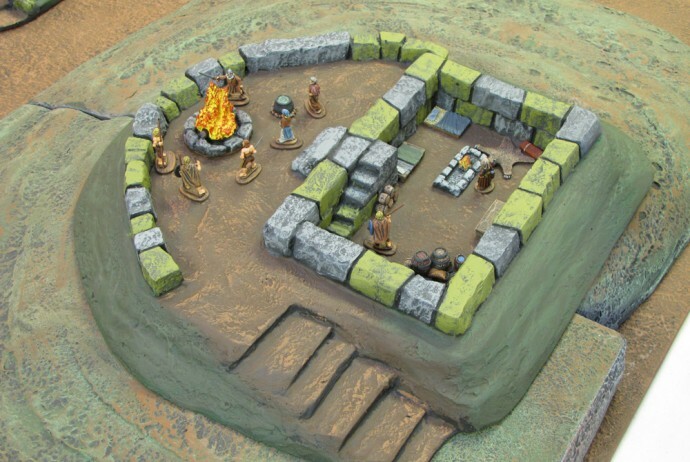 While we were busy constructing the Orc Temple, my husband spent drying time sculpting the next project: foundations to go under sod houses. 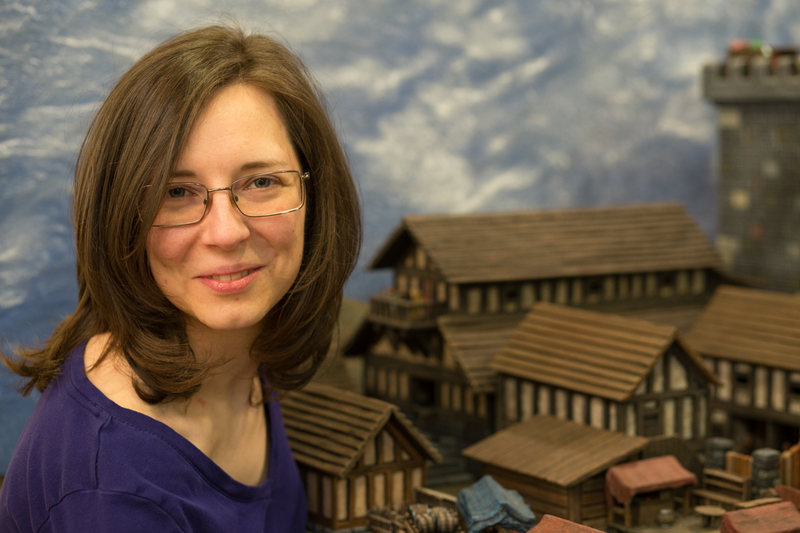 We wanted a presentation for the huts that would look good in a pastoral region, and let us set up scenes beneath them without fear of knocking over a mini or two. 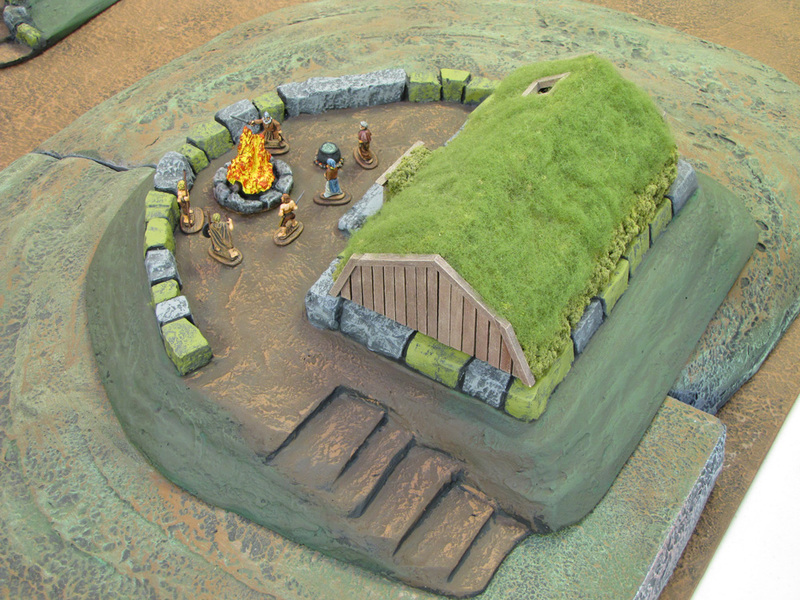 The sod huts were built long ago (circa 1994), from corrugated cardboard and cereal boxes, and detailed with balsa wood and model railroading turf. 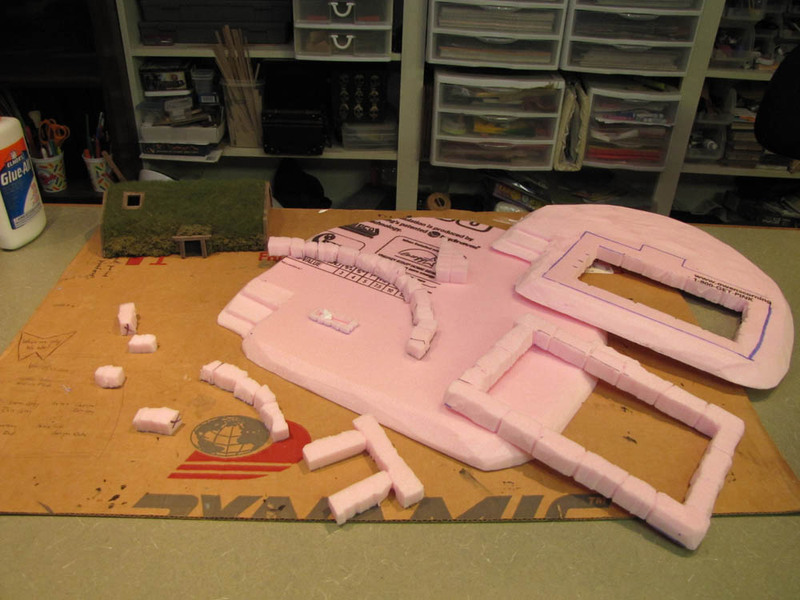 We decided to use three layers of pink 3/4″ foam insulation. The bottom layer made a solid ground surface. 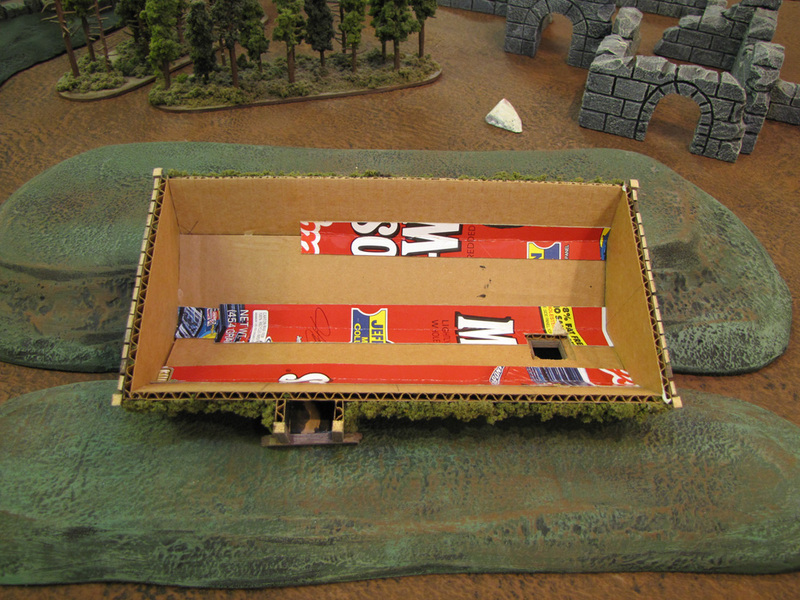 The second layer added height to the hill, and featured a cut-out for interior scenes. My husband carved the inside of the cut-out as stone to match the top layer which was a rectangle carved as a stone foundation. A few more stone walls delineated the homestead’s yard. 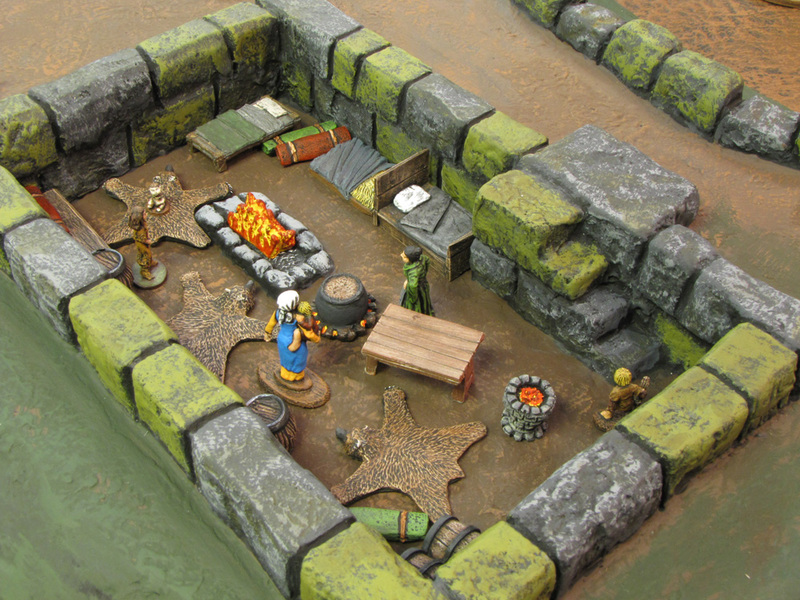 At this point he laid the hearth in as well, made of foam stone and resin flames. Some white glue and 24 hours later, we had a great foundation ready for plastering. And for playing with a little bit. 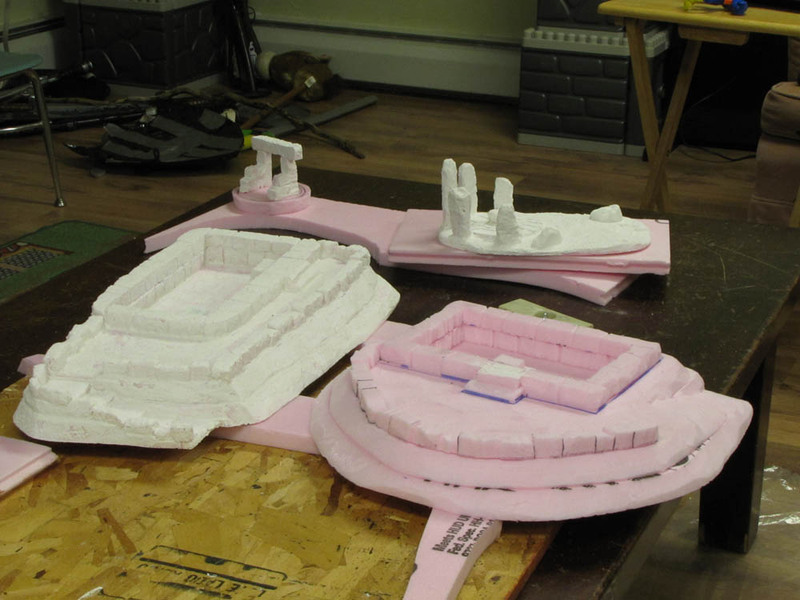 Shown with Bleddyn’s plastic castings and Teshub’s balsa furniture. Next step is the plastering. We used plastic vinyl spackle, spread on like frosting, textured with paper towels, and the details scraped clean with toothpicks. 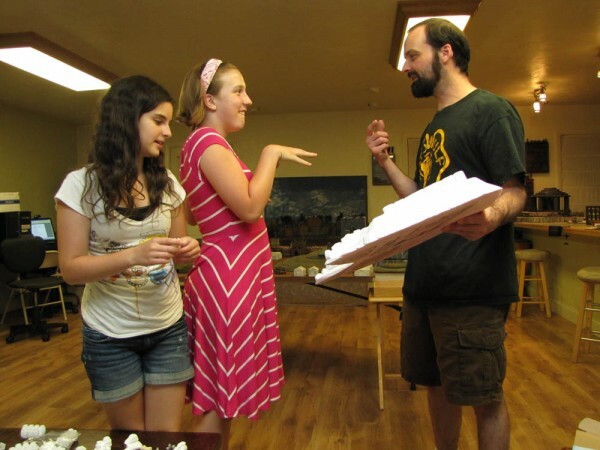 GM Teshub showing off the piece to Clan Modrak players. We left the plaster to dry for a few days this time. 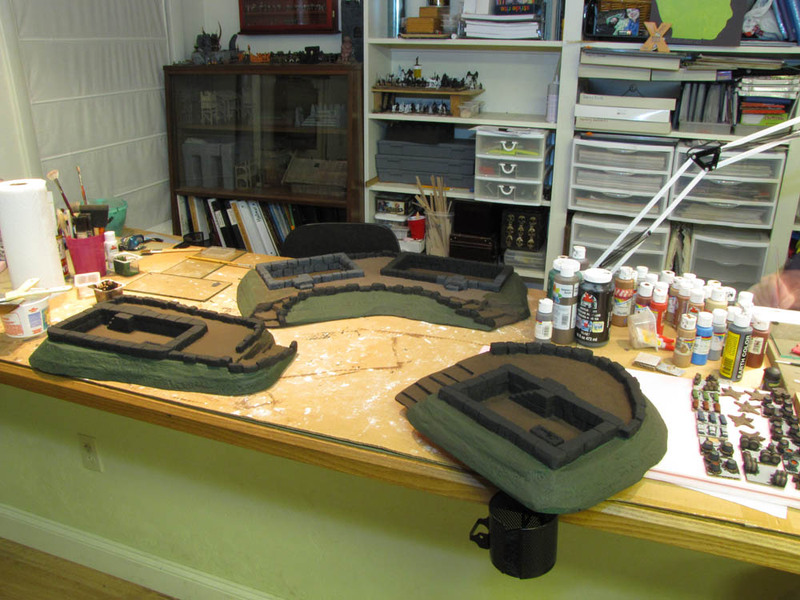 All of the surfaces were then painted with black acrylic paint, as many coats as it took to get a thick dark coverage. Some time after the black had dried, I started with the interior brown base. 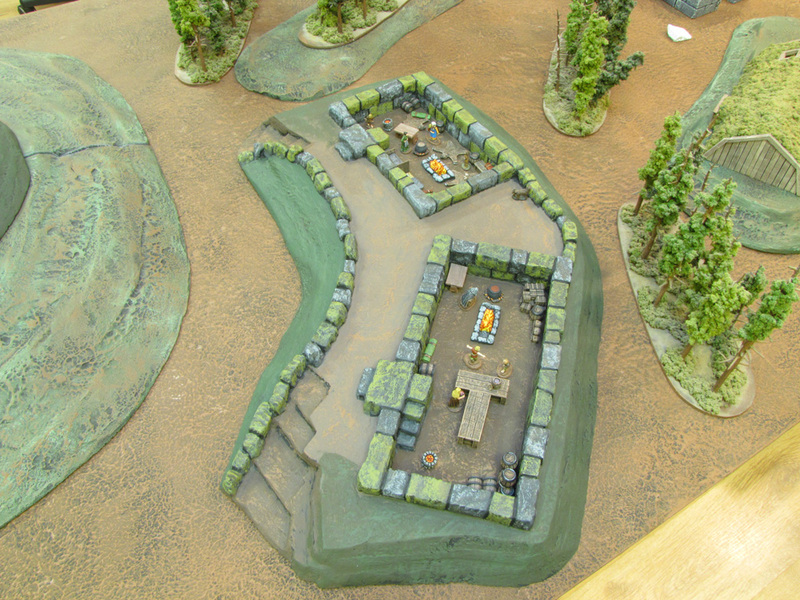 The hills and yards were base coated green and brown. Once those were done, the stones were all brushed in grey. 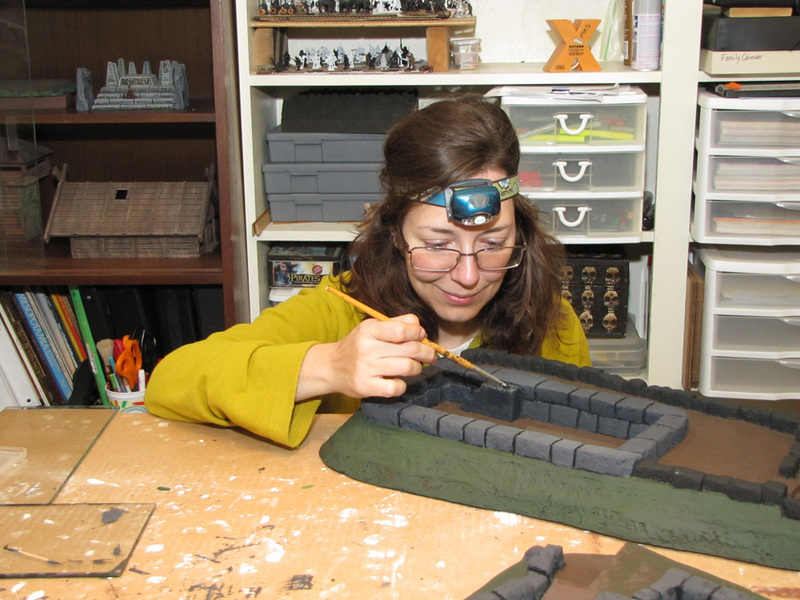 I was having a hard time painting dark grey in the corners of black bricks. Then I had a light-bulb-moment. 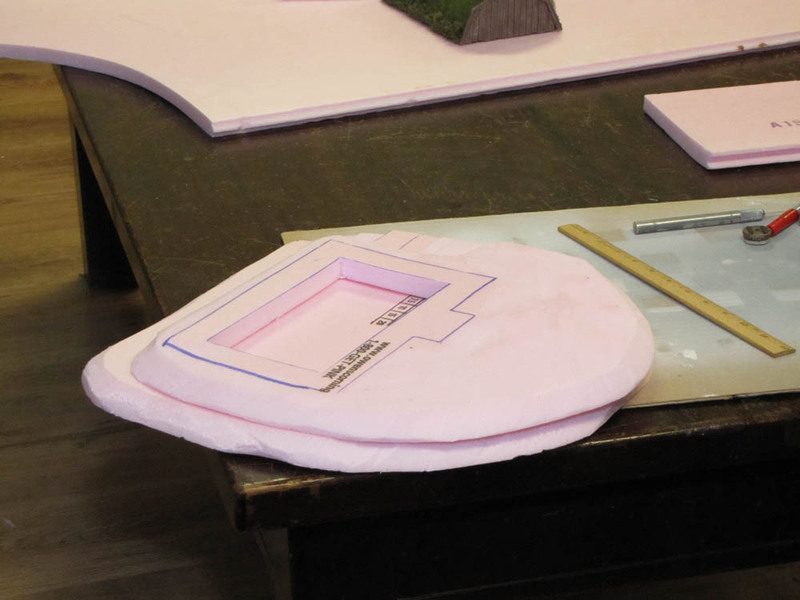 I relied heavily on the works of members of the Lead Adventure Forum for instruction and inspiration as I picked out about two-thirds of the stone in a sickly green highlight. 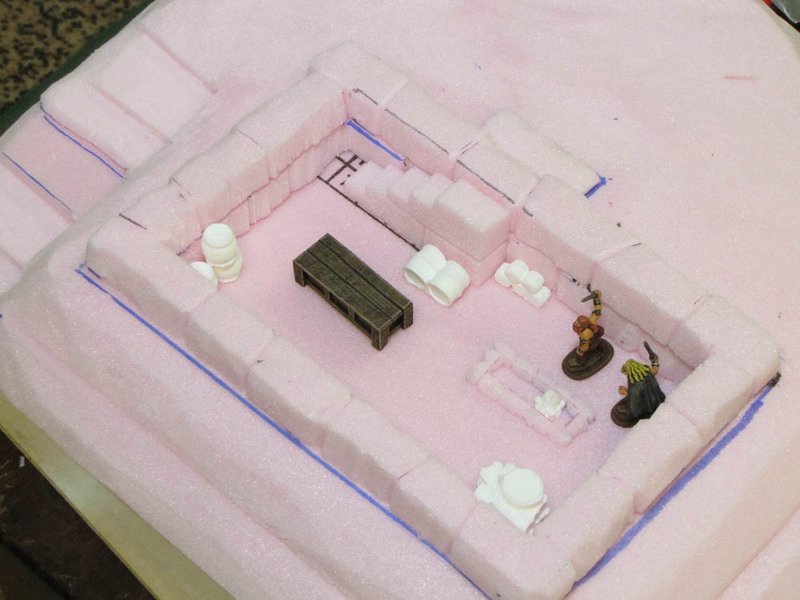 Now I was down to a week before game night, and it would be very beneficial to my character to have a nice place like this to spend the winter in! 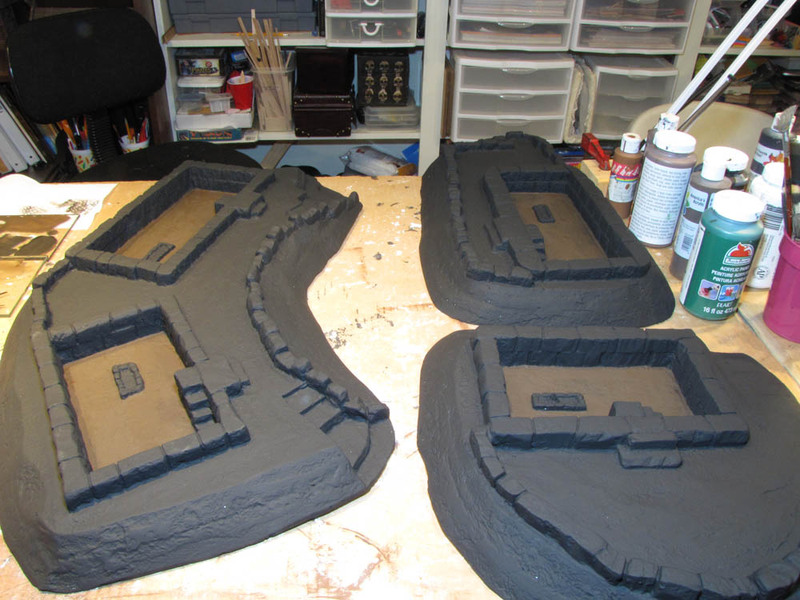 I used lightened shades of the base coats on the hills and yards. 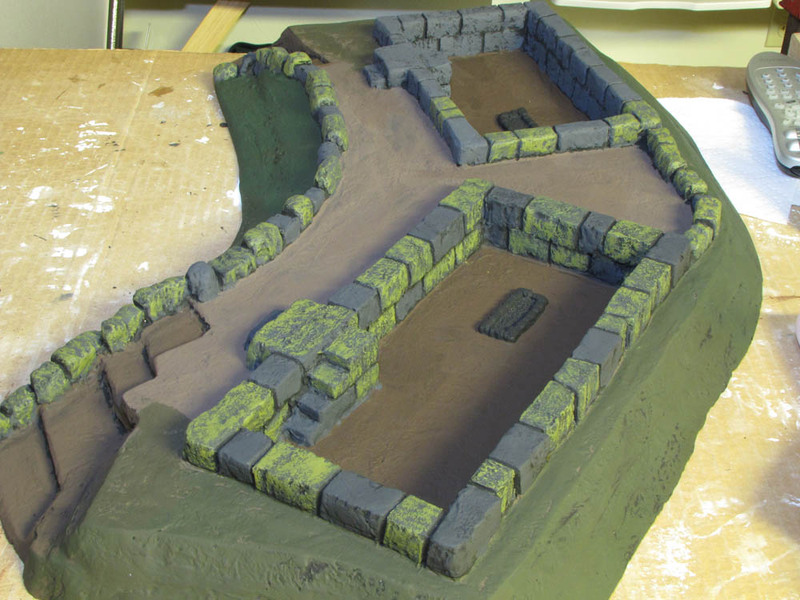 I finished off the walls with a sparse light grey highlight on the grey stones followed by a muddy green wash over all the stones. 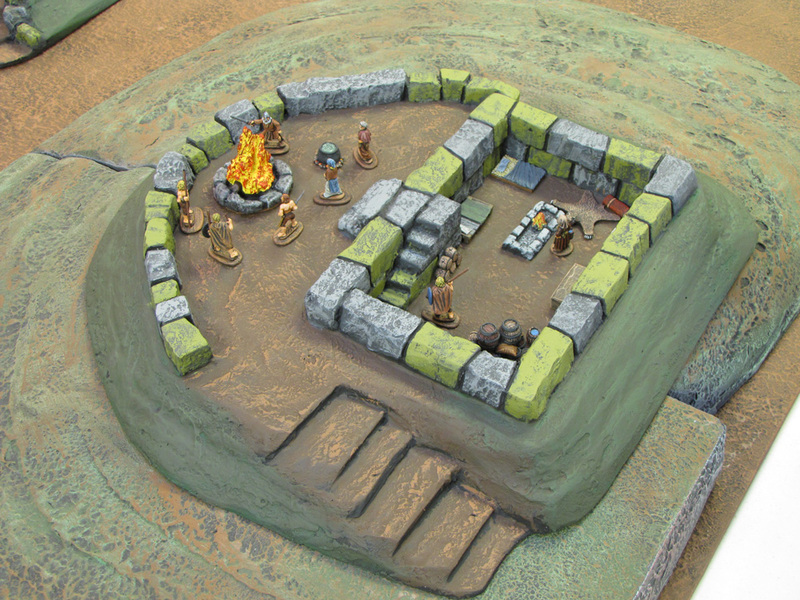 We dressed the foundations for Gautrian humans this game night with lovely castings by Bleddyn. The village of sod huts sat on one of the roads out of Timlin Town at the beginning of the evening for Sagas of the Gautrian Kings #44: Winter Wolves. Wynston, Bleddyn and Kvig had to escape the town. 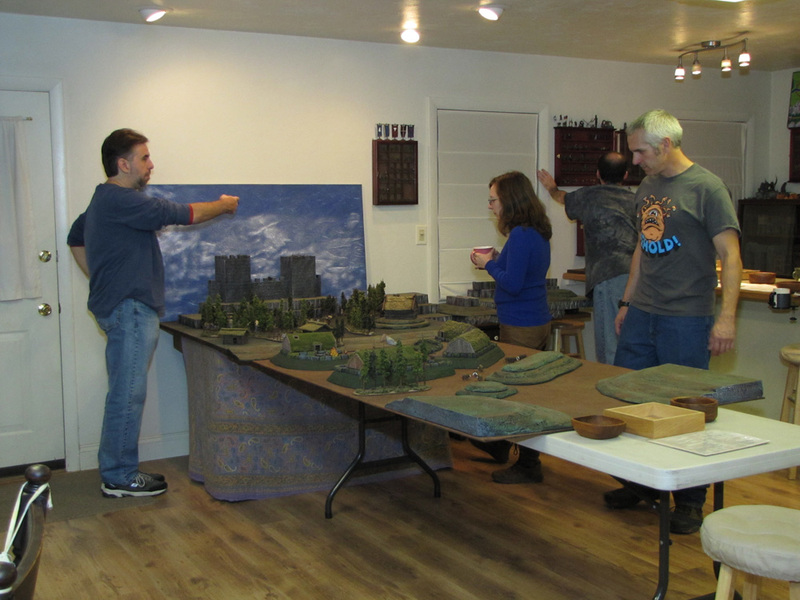 Here the rear Keep wall is shown against the backdrop of sky on the 4 foot x 4 foot table, with the outskirts of town sprawling down the length of the 8 foot table. 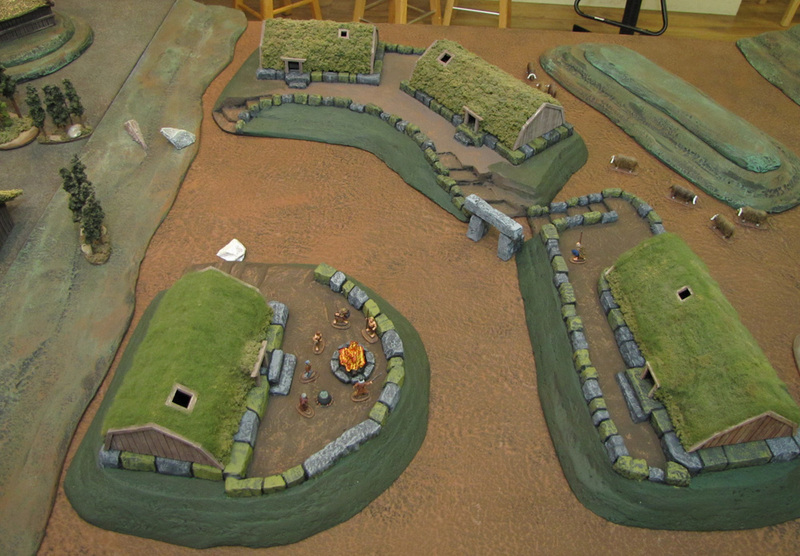 Later that evening the foundations served us well as the winter shelters for Wynston, Bleddyn and Kvig.